The Zelda Data Restoration Channel is available today to fix damaged save files. There's a weird bug in Nintendo's biggest game of the year Skyward Sword that basically breaks the story progression of Link's quest near its conclusion. Without dipping into spoiler territory, Nintendo released a guide (site seems borked, might have to view a cached copy) on how to work around the bug so players could complete the game. Many people were skeptical that any kind of patch would be possible for those who unwittingly messed up their game. Nintendo's Wii infrastructure doesn't have easy provisions for patching like its console brethren the PS3 and the Xbox 360, although with a game as big as Zelda you'd think Nintendo would have its top men working on a solution other than to start over, nooch. Apparently, the solution is to offer a free download of a dedicated Wii channel from the store called the "Zelda Data Restoration Channel." Once that channel is downloaded, all you have to do is fire it up and follow the onscreen instruction to repair your save game. Sounds pretty easy. Of course, that solution only works if you are connected to the internet and can download the channel from the Wii Shopping channel. For those of you without an internet connection (how are you reading this then, by the way? 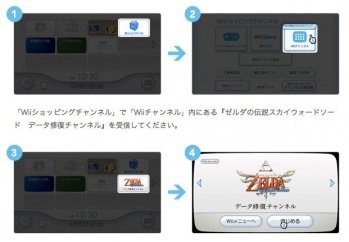 ), you can mail your Skyward Sword save game on an SD card to Nintendo and they will fix it for you. Find more details on the whole debacle on Nintendo's page. The Japanese-to-English translation from Google's codemonkeys is entertaining enough for the click through. "Thank you for your patronage of Nintendo products all the time." You're welcome.